BIGorexia - Is Bigger Actually Better? Welcome to the first of my three part series involving bigorexia. Across these three posts, I will be discussing the notion of muscle dysmorphia in society, what it is and how we arrived at the point we are today. There has been a term creeping into the mainstream recently, fueled by an unrelenting appreciation for the aesthetic. We’re all aware of anorexia nervosa and its harmful effects on the mental condition of humans, however I’m talking about a condition that lies on the other end of the physical spectrum. Awareness of this term has now shifted away from the confines of the underground bodybuilding community to the surface, ripe for widespread attention. I’m talking about bigorexia and the reality of the effects it can have on some of the most dedicated chasers of that elusively perfect physique. As a male, you could be the strongest, leanest and most physically capable person in your social group. You could be the envy of everyone around you; your friends, women and co-workers alike. Everyone wants to look like you. However, there’s a lingering sense of dissatisfaction. It’s never good enough, as there’s always a part of your body which could be improved upon in some way. Something just doesn’t look right. The fruits of intense physical and dietary labor are subsequently hidden behind a veil of loose fitting T-shirts and sweaters. An interview conducted by the BBC (13 mins) with 25 year old recreational bodybuilder Pradeep Bala presents a realistic glimpse into the psychology around this behavior. I’d recommend checking this video out if the notion of bigorexia is foreign to you. Whether we’re alternatively referring to it as reverse anorexia, Adonis complex or muscle dysmorphia, bigorexia is a preoccupation that that one is never big nor muscular enough. For men, it can be seen why muscle gain is such an appealing venture with research linking a muscular physique with power, dominance, strength, sexual virility and self-esteem. In fact, the ability to successfully “transform” your physique could even give a new found meaning to life, where past traumatic experiences such as childhood bullying or physical inadequacies pale in comparison to the new and improved version staring back in the mirror. This sense of physical adequacy or perhaps the fear of possessing perceived feminine traits may provide some men a sense of self-governance over areas where they feel a lesser degree of personal efficacy. In the realm of academia, bigorexia boasts very few publications despite it’s umbrella term body dysmorphia being no new phenomenon. 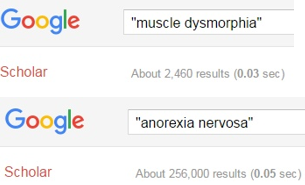 Using Google Scholar for reference, there exists roughly 256,000 articles for anorexia nervosa and only about 2,460 for muscle dysmorphia— a noticeable disparity in quantity of research. Put simply, it can affect anyone. Providing an accurate estimation of how many people experience bigorexia is very difficult, as it depends on the affected person first believing they have an issue and visiting an expert for help. In an attempt to bring it into perspective, body dysmorphia affected approximately 1–2% of the Australian population in 2011, which equates to over 22,000 people five years ago. More interestingly, a paper published in the Journal of Athletic Training in 2005 takes a step back and looks at how these behaviors may form by citing a study involving adolescent boys. The test group of adolescent boys were presented with three body images, where they were asked to select one which they believed to closely resemble their own. What would you like your body to look like? What do you think the ideal male body should look like? What do you think others think your body looks like? The first two questions were answered with the boys selecting body types that were 30–40 pounds heavier than their reference image. The answers to the third question revealed that the boys’ perception of their own bodies were much thinner and weaker than they actually were. Some boys even asked if they could make the largest image even bigger. The thought-provoking part of this example is that this study was conducted twelve years ago and those adolescent boys are now grown men. Could the type of boys who answered in this way over a decade ago be the same type of men who have evolved into bigorexics? I’m not even sure it’s possible to definitively claim such a thing. Nonetheless, this does illustrate the side effects varying types of media being presented to young, impressionable males and females. I’m going to just come out and say it. I’m not a fan of health and fitness magazines. While I can see that a basic beginner training routine may assist readers with combating decision fatigue early on, I don’t believe that it should be used as a resource in the long term. One thing to be aware of is that many of the fitness models gracing the pages actually push (and exceed) the physical boundaries naturally attainable by the average person. Mike O’Hearn is no stranger to covers of fitness magazines. According to his bio on Bodybuilding.com, he stands at 6″3′, weighs 247lbs and has a body fat percentage of 4%. He is also 47 years old. If these numbers seem speculative, you be the judge. Is this something you can achieve with good old fashioned hard work, diet adaptations and the setting of measurable fitness objectives? For an individual like this, the BMI (Body Mass Index) should not be used. Actually, I’d probably advise against ever using it as a reference unless we’re talking about a large scale statistical analysis of the general population. A study of elite athletes (some admitted steroid users and some not) combined with an analysis of 20 Mr. America contest winners from the 1939–1959 pre-steroid era, determined that a fat free mass index of 25 is pretty much an upper limit for someone who does not use steroids. 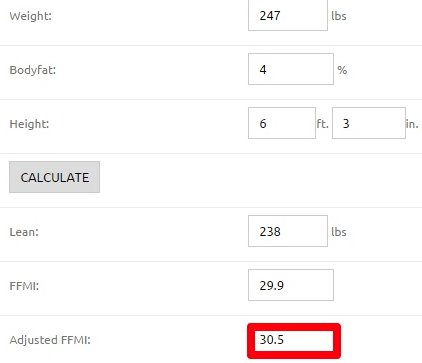 A fat free mass of 19 is the average for males. If a FFMI of 25 is considered an upper limit for a clean athlete, has Mike O’Hearn, the 4x Mr. “natural” Universe title been lying to us? It definitely raises some questions, especially when he’s registering an adjusted FFMI in excess of 30. Needless to say, the argument of natural or unnatural is a fiercely debated topic in the fitness industry. With that being said, I’ll leave it to you to draw your own conclusions. Now picture what a young adolescent boy would be thinking when catching a glimpse of this herculean individual for the first time, completely unaware of what goes into maintaining this physique behind closed doors. Awe? Jealousy? Physical inadequacy? The imposed expectations can be worrying, especially on young, impressionable minds. The question must be asked — is it worth it? An article written by the ABC in 2014 discusses the rise of male body image issues in Australia, particularly around young men between the ages of 16–25. When perceived self worth becomes so intrinsically tied to physical appearance, issues can arise, especially when steroid use is thrown into the emotional cocktail. This is an incredibly subjective topic, especially when it comes to what people choose and choose not to do with their bodies. There is simply no right nor wrong answer. Care should be taken, especially with teenagers who begin to express a do whatever it takes mentality with respect to becoming bigger and more muscular. A teenager’s lack of emotional maturity therefore necessitates positive role models that can appropriately guide them when making decisions involving their bodies. In a more extreme case of continuing to do whatever it takes, 51 year old Ronnie Coleman, an 8x winner of Mr. Olympia, underwent 11 hours of major back surgery earlier this week after an injury was sustained during training. Ronnie is known as one of the strongest and hardest working bodybuilders the world has seen and has now paid a substantial price for it. He is now presented with a long, arduous rehabilitation program as he learns how to walk once more. I sincerely wish “Big Ron” all the best in his recovery. Generally speaking, Bigorexia is here to stay and we must continue to educate ourselves on what to look out for and understand how to mitigate the associated psychological side effects. This will allow us all to continue maintaining a realistic perspective in relation to our health, fitness and appearance. Like the content? Receive a weekly update.